Day on the Bay is an annual event sponsored by local service providers to inspire and encourage healthy families and friendships. 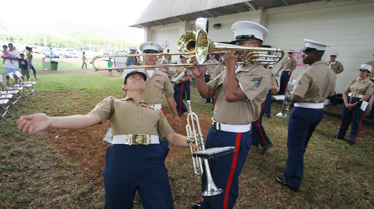 They celebrate many of the diverse cultures represented in their community by having cultural entertainment, the Marine Forces Pacific Band, food, a craft fair, a petting zoo, food vendors, a resource fair and free kayaking and sailing on Kaneohe Bay. Here, Sgt. Harmony Lazore did the limbo Saturday under Cpl. Bill Watson's trombone. 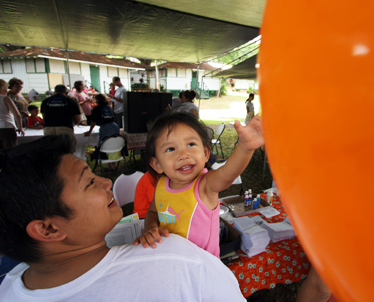 Happy 2-year-old Diamitri Inouye tried to hit a balloon floating over his father Vance's shoulder. They were waiting to get Diamitri's face painted. 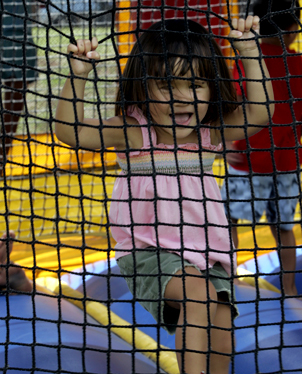 2-year-old Reese McDonald jumped inside the inflatable bounce house.